What makes this splash page worth $38,837.50? I kid you not, that's what this art just sold for in the last Heritage auction. It's a lovely Steve Ditko splash page, from one of his most personal pieces of work and, if you've seen Watchmen and have read Mr A, you'd know that there's a very highly likelihood that Mr A, along with another Ditko creation, The Question, can be considered to be the inspiration behind Rorshach. Still, $38,000+? That's a fair chunk off a small house. 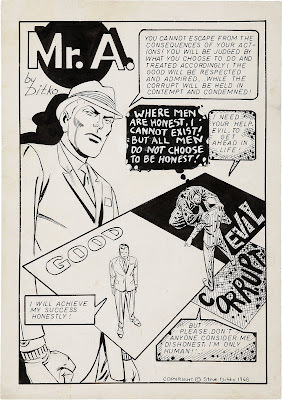 It's a brand new car, and it's an amount that would have snared you the following Ditko pieces in the same auction, with change. I wrote about one of these comics back in February 2007, but I've decided to revisit and update it, but hey, why not use some old text? First up is an absolute classic. Titled 'The Phantom Zone' and published in October 1982, this 96 page giant reprints the entire Phantom Zone mini-series by Steve Gerber and Gene Colan, in glorious black and white! It rarely gets better in comics books - Gerber and Colan - and this one comic is proof why we Australians were utterly spoiled when it came to reprint comics. The American originals cost $0.60 each - that'd be an investment of $2.40 for the entire four issues. In colour. And, as we all know, Gene doesn't look anywhere near as sweet in colour as he does black and white, in magazine format to boot. So this was a cheaper, and, in my own opinion, a better way to obtain the story. Dr Fate in Smallville: Absolute Justice! I seriously have to start watching Smallville again. Truth be known, I was never that much of a Dr Fate fan until Keith Giffen began to write him, and then when Kevin Maguire drew him in the revamped Justice League...oh Lord! So you can imagine my genuine surprise, and joy, at seeing this spoiler for a forthcoming Smallville movie length episode. Written by Geoff Johns, Smallville: Absolute Justice is set to air in the USA on Feb. 5th, 2010. Hopefully I won't have to wait too much longer after that to catch it And I do hope they don't stuff up Fate.